Ameerul Momenin Hazrat Aki (a.s) in Quran. ayah 6 "Keep us on the straight path (siratul mustaqeem)"
ayah 26 , "Surely Allah is not ashamed to set forth any parable, even that of a gnat or anything above that; as for those who believe, they know that it is the truth from their Lord,"
ayah 38 "We said: Go forth from this (state) all; so surely there will come to you a guidance from Me, then whoever follows My guidance, no fear shall come upon them, nor shall they grieve"
ayah 45 "And see assistance through patience and prayer, and most surely it is a hard thing except for the submissive ones." ayah 105 "Those who disbelieve from among the followers of the Book do not like, nor do the polytheists, that the good should be sent down to you from your Lord, and Allah chooses especially whom He pleases for His mercy, and Allah is the Lord of mighty grace." Abu Salih narrates from Hammar who narrates from Imam Reza (as) who narrates from His Forefathers the saying of Imam Jafar Sadiq (as) regarding this ayah, "Allah chooses especially whom He pleases for His mercy" , Imam (as) said, "Allah has chosen His Prophet, His Successor, and His Offspring for His mercy. Allah has 100 different kinds of mercy. 99 of which are for Muhammad (saw), Ali (asws), and His Offspring. One is for all of the believers". ayah 138 "We take our color from Allah and who is better than Allah at coloring. We are His worshippers"
ayah 185 "The month of Ramazan is that in which the Quran was revealed, a guidance to men and clear proofs of the guidance and the distinction; therefore whoever of you is present in the month, he shall fast therein, and whoever is sick or upon a journey, then (he shall fast) a (like) number of other days; Allah desires ease for you, and He does not desire for you difficulty, and (He desires) that you should complete the number and that you should exalt the greatness of Allah for His having guided you and that you may give thanks." ayah 238 "Be guardians of your prayers and of the middle prayer and stand up with the devotion to Allah"
ayah 256 "Whoever disbelieves in the Shaitan and believes in Allah he indeed has laid hold onto the firmest handle, which shall not break off, and Allah is Hearing, Knowing." The people asked, "O'RasoolAllah (saw), what is the firmest handle?" RasoolAllah (saw) replied, "The Wilayat of the Master of the Successors." The people asked, "O'RasoolAllah (saw), who is the Master of the Successors?" RasoolAllah (saw) replied, "Ameerul Momineen (saw)." The people asked, "O'RasoolAllah (saw), who is Ameerul Momineen (saw)?" RasoolAllah (saw) replied, "The Master of Muslims and their Imam after Me." The people asked, "O'RasoolAllah (saw), who is the Master of Muslims and their Imam after You?" RasoolAllah (saw) replied, "My Brother, Ali (saw) ibn Abi Talib"
ayah 265 "And the parable of those who spend their property to seek the pleasure of Allah and for the certainty 'of their souls is as the parable of a garden on an elevated ground, upon which heavy rain falls so it brings forth its fruit twofold but if heavy rain does not fall upon it, then light rain (is sufficient); and Allah sees what you do." ayah 7 "He it is Who has revealed the Book to you; some of its verses are decisive, they are the basis of the Book, and others are allegorical; then as for those in whose hearts there is perversity they follow the part of it which is allegorical, seeking to mislead and seeking to give it (their own) interpretation"". ayah 18 "Allah bears witness that there is no god but He and so do the angels and those possessed of knowledge, maintaining His creation with justice; there is no god but He the Mighty, the Wise"
ayah 61 "But whoever disputes with you in this matter after what has come to you of knowledge, then say: Come let us call our sons and your sons and our women and your women and our nafs (selves) and your nafs (selves), then let us be earnest in prayer, and pray for the curse of Allah on the liars"
ayah 103 "And hold fast by the rope of Allah all together and do not separate" Ibne Abbas (ra) narrates "One day I was with RasoolAllah (saw) when a man came and asked RasoolAllah (saw) regarding this ayah. The man asked, "Who is the rope of Allah?" RasoolAllah (saw) replied, "I am the Prophet of Allah and Ali (asws) is the rope of Allah." The man left saying, "I believe in the Prophet of Allah and hold fast to His Rope". ayah 112 "Abasement shall be their portion wheresoever they are found except where they grasp a rope from Allah and a rope from men"
ayah 193 "Our Lord! surely we have heard a preacher calling to the faith, saying: Believe in your Lord, so we did believe; Our Lord! forgive us therefore our faults, and cover our evil deeds and make us die with the righteous"
ayah 3 " This day have I perfected for you your religion and completed My favor on you and chosen for you Islam as a religion "
ayah 7 "Remember Allah's grace upon you and His promise by which He bound you when you said: We hear and we obey; And keep your promise to Allah. He knows what is in the chests of men." ayah 44 "But when they neglected that with which they had been admonished, We opened for them the doors of all things, until when they rejoiced in what they were given We seized them suddenly; then lo! they were in utter despair"
ayah 46 "on the most elevated places there shall be men who know all by their marks" Hasham asked Imam Muhammad Baqir (as) regarding this saying of Allah, "What does it mean there will be men on araaf (elevated places)?" Imam (as) replied, "Do you not kno w there are people from amongst your tribe who know who is good and who is bad. We are those people who will know Our lovers by the marks on their foreheads"
Zadan said to Salman (as), "I have heard RasoolAllah (saw) say more than 10 times say regarding Al i (asws) ibn Abi Talib (as), "You and Your Successors will be on Araaf between jannah and jahannum. ayah 157 "Those who follow the Messenger-Prophet, the Ummi, whom they find written down with them in the Taurat and the Injeel (who) enjoins them good and forbids them evil, and makes lawful to them the good things and makes unlawful to them impure things, and removes from them their burden and the shackles which were upon them; so (as for) those who believe in him and honor him and help him, and follow the noor which has been sent down with him, these it is that are the successful"
ayah 62 "And if they intend to deceive you-- then surely Allah is sufficient for you; He it is Who strengthened you with His help and with the believers"
ayah 105 "And say: Work; so Allah will see your work and (so will) His Messenger and the believers (momin); and you shall be brought back to the Knower of the unseen and the seen, then He will inform you of what you did"
ayah 43 "Say: Allah and whoever has knowledge of the book is sufficient witness between me and you"
Abu Baseer narrates, "I heard Imam Abu Jafar (as) saying regarding this ayah, Imam (as) said, "This ayah "that men of understanding may take heed" is referring to those who love Him (Moula Ali asws), His Shia." ayah 77, "Until We open for them the door of extreme punishment, behold! They are in despair at it." ayah 35 "Allah is the light (noor) of the heavens and the earth; a likeness of His light is as a niche in which is a lamp, the lamp is in a glass, (and) the glass is as it were a brightly shining star, lit from a blessed olive-tree, neither eastern nor western, the oil whereof almost gives light though fire touch it not-- light upon light-- Allah guides to His light whom He pleases, and Allah sets forth parables for men, and Allah is Cognizant of all things"
Muffassil bin Yassar narrates I asked Imam Jafar Sadiq (as) regarding this ayah of Allah. Regarding "Allah is the light of the heavens and the earth" Imam (as) said, "Yes, Allah is like this." Then I asked about , "a likeness of His light". Imam (as) replied, "This is Muhammad (saw)." I said, "In which is a lamp". Imam (as) said, "This refers to the heart of Muhammad (saw)." I asked, "What is lamp? What is its light?" Imam (as) replied, "The light of knowledge is in reference to the nabuwiat of Muha mmad (saw)." Then I asked regarding this ayah, "lit from a blessed olive tree neither of the east nor of the west." Imam (as) said, "This is in reference to Ameerul Momineen (asws). It is not for any jewish or christain." Then I asked about this ayah, "Whose oil almost glows itself though no fire touch it" Imam (as) said, "This is in reference to Aal e Muhammad (as)." Then I asked about "noor upon noor" Imam (as) said, "This is in reference to Imams (as) after Imams (as)." ayah 55 "Allah has promised to those of you who believe and do good that He will most certainly make them representatives in the earth as He made representatives of those before them and that He will most certainly establish for them their religion which He has chosen for them"
ayah 4 "if We please We would send down upon them a sign from the heavens so that their necks would remain bowed before it." ayah 40 "One who had the knowledge of the Book said: I will bring it to you in the twinkling of an eye. Then when he saw it settled beside him, he said: This is of the grace of my Lord that He may try me whether I am grateful or ungrateful; and whoever is grateful, he is grateful only for his own soul, and whoever is ungrateful, then surely my Lord is Self- sufficient, Honored"
ayah 35 "We shall appoint a sultan for the both of you and Firoan and his followers will not be able to reach you because of Our Signs." "After Musa (as) and Haroon (as) received the orders of Allah to preach to Firoan, they started o ff towards the court of Firoan. Both of them were extremely frustrated and worried as to how they would be treated by Firoan. Along the way, they saw a rider approaching them. He was wearing a dress adorned with gold and silver stitching and holding a swor d made of gold. He said to them, "Follow Me. Do not have any fear." This rider reached the court of Firoan and said, "Obey these two prophets. If you do not, I will kill you." Upon hearing these words, Firoan became so frightened. Then this rider disappeared. Firoan asked Hz Musa (as) and Haroon to come to his court the next day and say whatever it was they wished to say. When Musa (as) and Haroon (as) left, Firoan asked his guards, "Why did you allow this rider to enter without my permission?" The guards r eplied, "We swear by your honor, we did not see any rider. We only saw these two brothers." That rider was Ameerul Momineen Ali (as) ibn Abi Talib (as). Allah hiddenly helped all the prophets through Ali (as) and openly helped Muhammad (saw) through Ali (as). Moula Ali (as) is that great Kalim ul Kubra (greatest word of Allah) which Allah sent in order to help His prophets in every age and in various forms. Ali (as) always was a helper to the prophets, messengers, and friends of Allah. 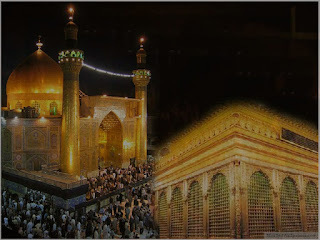 All the prayers of the prophets, messengers and friends of Allah were accepted through Moula Ali (as). All of their problems, difficulties, and sufferings were removed through Moula Ali (as). This ayah of Quran refers to that incident; "We shall appoint a sultan for the both of you and Firoan and his followers will not be able to reach you because of Our Signs." Ibne Abbas (ra) narrates that rider was Ayatul Kubra (greatest sign) and Sultan for them. ayah 23 "Of the believers are men who are true to that which they covenanted with Allah. Some of them have paid their vow by death (in battle), and some of them still are waiting; and they have not altered in the least"
ayah 32 "We gave the book for an inheritance to those whom We chose from among Our servants but of them is he who makes his soul to suffer a loss, and of them is he who takes a middle course and of them is he who is foremost in good deeds by Allah's permission; this is great favour"
Salim narrates I asked Imam Abu Jafar (as) regarding this ayah, Imam (as) said, "Those who are foremost in deeds of goodness are Imams (as) and those who take the middle course are those who recognize the Imams (as). Those who wrong themselves are those who do not r ecognize the Imams (as)." ayah 27 "And We did not create the heavens and the earths and what is between them in vain"
ayah 75 "Are you proud or are you of the exalted ones?" Abu Saeed Khudri narrates, "We were sitting with RasoolAllah (saw) when a man came and said, "O'RasoolAllah (saw)! Tell me about iblees regarding this ayah, "Are you proud or are you of the exalted ones?" . O'RasoolAllah (saw)! Who are those who are greater than angels?" RasoolAllah (saw) said, "Myself, Ali (asws), Fatima (sa), Hasan (as), and Hussain (as). ayah 33 "And he who brings the truth and (he who) accepts it as the truth-- these are they that guard (against evil)." ayah 8 "As for those who believe and do good, they shall surely have a reward never to be cut off"
ayah 4 "And surely it is in the original of the Book (umm al kitab) with Us, Most High, Most Wise"
Imam Sadiq (as) narrates, "Ameerul Momineen (asws) is umm al Kitab (original of the book). This is in accordance with the saying of Allah, "Keep us on the straight path" (1:6). (Maani ul Akbar pg 32) In the tafseer of this ayah, Imam (as) said, "Ali ul Hakeem (Most High Most Wise) is Ameerul Momineen (asws). ayah 28 "That is because they follow what is displeasing to Allah and are averse to His pleasure therefore He has made null their deeds" Jabir bin Yazid narrates from Imam Abu Jafar (as) regarding this ayah, Imam (as) said, "They disliked Ali (asws) and refused to follow Him while He was the pleasure of Allah and His Prophet." ayah 9 "But observe the measure strictly nor fall short thereof" Dawood al Rikki narrates, "I asked Imam Jafar Sadiq (as) regarding this saying of Allah, "the stars and the trees prostrate to Him" (55:6). Imam (as) said, "Star is RasoolAllah (saw) and trees is in reference to Ameerul Momineen (asws) and Aimmah (as) who even for the blink of an eye never disobeyed Allah." Dawood says, "Then I asked regarding this ayah, "And the heaven, He raised it high and He set the measure" (56:7). ayah 40 "a group (thalit) of those of later time"
ayah 20 "Not equal are the dwellers of the fire and the dwellers of the garden. The owners of the garden, They are the victorious. ayah 4 "Then surely it is Allah who is his master and Jibrael and the believers who do good"
ayah 51 "Verily! He is Haqqul Yaqeen!" Imam Jafar Sadiq (as) said regarding this ayah, "Verily! He is Haqqul Yaqeen!" Imam (as) said, "Verily! Haqqul Yaqeen is Ameerul Momineen (asws). One who denies this has turned away from haqq (truth)." ** 1. ayah 3 "And the bearer of witness and those against whom the witness is borne"
ayah 8 "and strive to please your Lord" Imam Abu Jafar (as) narrates, "RasoolAllah (saw) would never speak regarding His successor until a verse was revealed from Allah or until the appropriate time had passed. When RasoolAllah (saw) knew the time of His death this ayah was revealed, "So when you are free, nominate and strive to please your Lord" . In this ayah, Allah says "When You are free from Your prophecy, nominate Ali (asws) as Your successor and announce it so RasoolAllah (saw) said, "Whomsoever I am His Moula, Ali (asws) is His Moula. O' Allah! Love him who loves Ali asws and hate him who hates Ali asws, help him who helps Ali asws. Condemn him who denies Ali asws." RasoolAllah (saw) repeated this three times. ayah 6 "Except those who believe and do good so they shall have a reward that will never be cut off"